NASA hasjoined astronaut Randy Bresnik, who is in orbit now, in the waiting game forthe birth his daughter, just one day before the spaceflyer is poised to makehis first spacewalk. ?There?s noword yet,? space station flight director Brian Smith told reporters lateFriday. Bresnik isflying on NASA?s spaceshuttle Atlantis, which is docked at the International Space Station todeliver tons of spare parts and other supplies. His wife Rebecca, meanwhile, ishere on Earth preparingto give birth to their second child - a baby girl. NASAofficials said the baby?s birth was slated for as early as today, while Bresnik and his crewmates delivered a wealth of supplies and performed vital station maintenance. But it couldnow be tonight or sometime Saturday, when Bresnik and another crewmate are dueto step out on their mission?s second spacewalk. Smith said all of NASA is pulling for the Bresnik family, but joked that thebaby?s delayed arrival has thrown a wrench into NASA?s well-oiled shuttle mission plan. He said as much to the flight surgeons at MissionControl in Houston. ?I toldthem, ?Don?t the doctors and Rebecca realize this is NASA and I?ve got a reallywell thought out, well-planned, meticulous plan, and they are not abiding byit,?? Smith said with a smile. ?But I am not going to be able to control thatsituation. Rebecca?s on her own.? Bresnik andhis wife initially believed they could not have a biological child and adopteda son, now 3 1/2, from Ukraine last year. They found out Rebecca was pregnant justa few months later. In a NASAinterview recorded before Atlantis launchedMonday, Bresnik and his wife said they planned to induce the baby?s birth twoweeks early because of medical concerns and hoped that would allow them someleeway in coordinating her arrival to a less-busy time in Bresnik?s mission. ?Bresnikwill perform two spacewalks - on Saturday and Monday, respectively - before themission ends with a post-Thanksgiving landing on Nov. 27. That may notbe the case now. But Smith said that is completely okay. ?We will accommodatewhatever Rebecca and her new baby want to do,? he said. Bresnik hassaid his situation is no different from those experienced by military personnelwho are deployed overseas, away from their families. 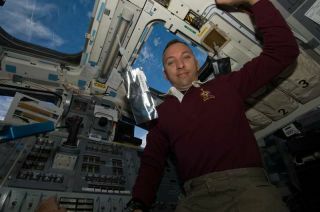 He is by nomeans the first parentto fly in space, but he is only the second American to be in orbit whileexpecting his wife to give birth. NASA astronaut Michael Fincke coached hiswife through the birth of their daughter from the space station during his ownlong-duration flight in June 2004. Fincke met his daughter Tarali Paulina forthe first time when she was four months old. If Bresnik?sdaughter is born during Saturday?s spacewalk, Smith will speak with flightsurgeons and draw up a plan for notifying the astronaut. Bresnik will be 100percent focused on his mission, regardless, Smith said. ?I?m just asinterested as everybody else, and I?m hoping that everything just works outperfect for them,? Smith said.